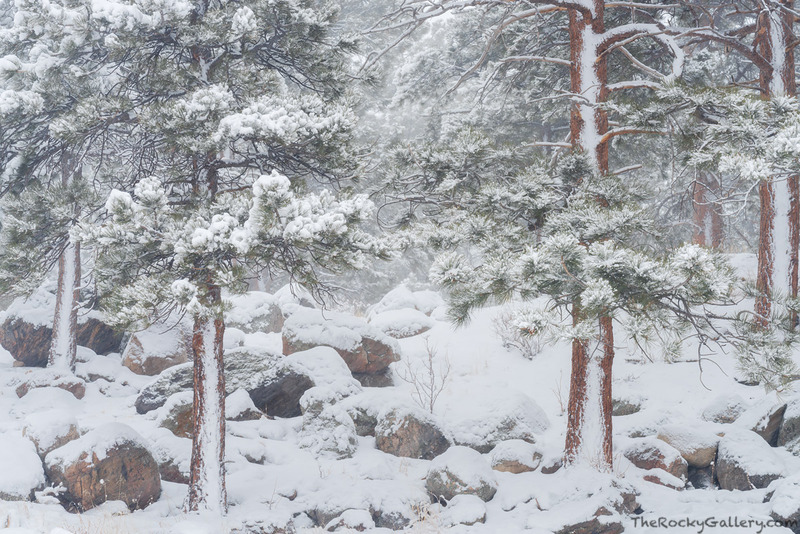 Snow can accumulate quickly during the winter months in Rocky Mountain National Park. The entire landscape can be covered with snow turning the landscape to a featureless snow covered landscape. Ponderosa Pines however can always be counted on to add something of interest even during heavy snows. These proud Ponderosa Pines in Moraine Park weather this February snowstorm collecting its heavy snow on their branches but staying as beautiful as ever. The red trunks of the Ponderosa Pine stand out against the falling snow and add a dash of color to this winter landscape. Photo © copyright by Thomas Mangan.